In the old days before the media decided they had to scare people about everything, tourism went up, because it was a chance in a lifetime to see real lava flowing! The media even presented it that way. Of course I think park service folks have wised up as well, and probably think showing folks real lava flows is too risky as well. We went through the same situation with the BP Horizon disaster. TV reporters interchanged beach footage and verbal discriptions to imply that the entire gulf Coast was ruined by the spill. We worked hard to convince people that the Florida beaches east of Pensacola were fine. There were a few small "tar balls" reported one day that entire summer. There were cleanup crews out every morning but mostly had nothing to do. The news media cost us personally more money than the actual spill did but BP had to pay for it. We should all join the fight against anthropogenic volcanic change. While I appreciate the frustration of this, and I suspect that your wife's cousin's report is generally accurate, I dropped straight into "that can't be right" territory in the first ten words. I don't think the Big Island has room for anything to be 120 miles away from anything else. 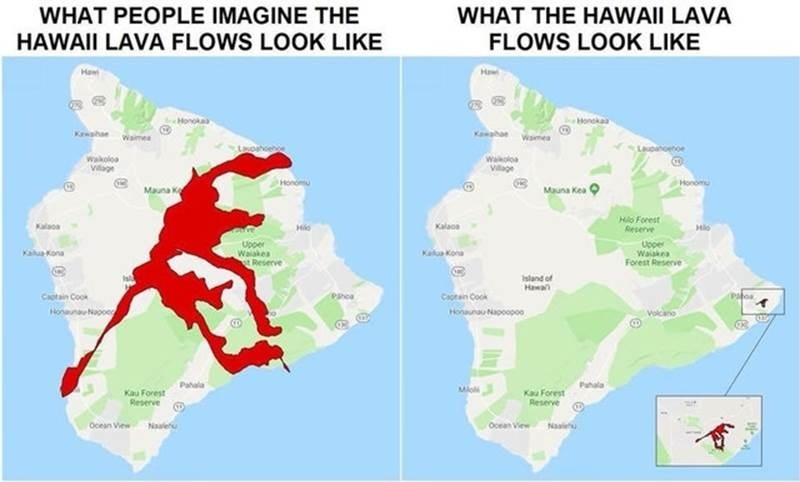 A quick check on Wikipedia indicates that my intuition is correct, nothing on the island of Hawaii can be more than 93 miles away from anything else on the island, and Google Maps puts Hapuna beach at about 60 statute miles from the Kilauea crater. So I have to drop out of accepting expert advice and start critically evaluating the whole thing. Seems legit, but that's the sort of damaging little mistake to avoid going forward. On a related note, I have long thought that the most biased coverage on television was on the weather channel. They are so eager for a storm to become a hurricane, and for a hurricane to hit land, that you can almost see them wishing for it to be true. OK but what bout this? thank you look fwd to your answers we don't get anything right over here. thank you for that, i question everything as mainstream news is worthless, this guy makes is all sound like just a burp.I asked above about 2 links i found this morn one is a pic of the thermo/gas issue doesn't look good, how am i supposed to tell whats true or not or what it means eve. have a good one.